QUESTION: What do the 65,000-tonne aircraft carrier the Prince of Wales currently being built at Rosyth and the new Range Rover PHEV have in common? Answer: They are both hybrids. The Prince of Wales is propelled by four electric motors powered by four 15,000hp diesel generators (and two Rolls-Royce gas turbines for a bit of extra torque when needed). And the Range Rover and Range Rover Sport use a 2.0-litre petrol engine mated to a 85kW electric motor delivering 404hp. And there the similarity more or less ends. But since Jaguar Land Rover support both the Prince of Wales and its sister ship, the Queen Elizabeth, they reckoned it might be interesting to drive one hybrid in order to go and inspect the other, slightly bigger one. 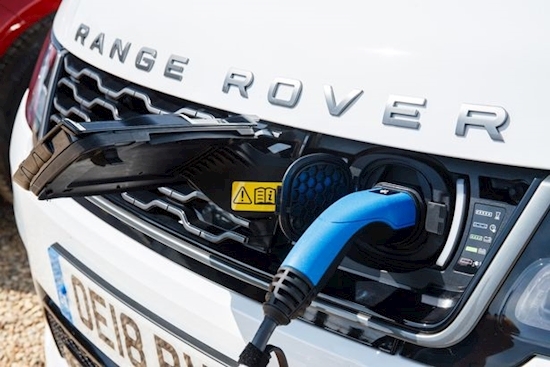 This is Land Rover’s first venture into plug-in hybrid electric technology and likely to be watched closely by all those who love – nay adore – their big beasts. The PHEV will give them, with judicial use of the electric motor, up to 101mpg – a figure not to be sneezed at. 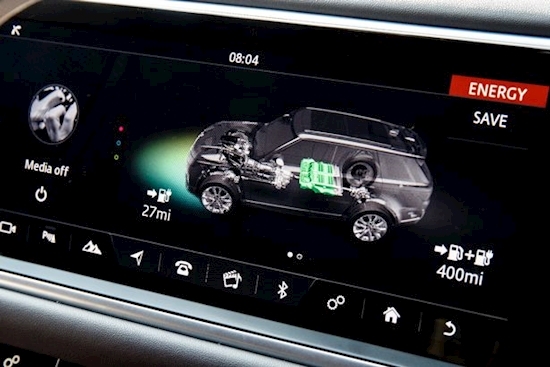 Of course, Jaguar have already been hugely successful with the I-PACE so now it is up to Land Rover to convince their expectant customers that a hybrid can give them the power and performance they have come to expect from their Rangie. 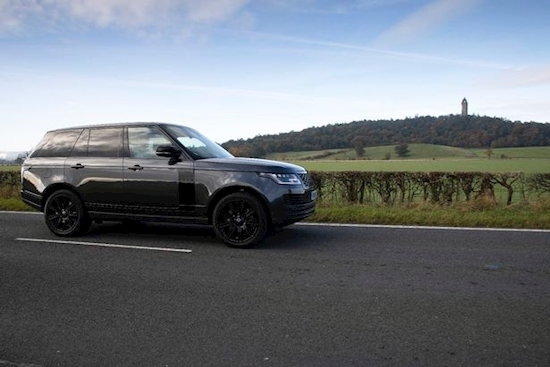 The beauty of both cars – the Range Rover and the Sport – is that, to all intents and purposes, they look exactly the same whether with a straight internal combustion set-up or a hybrid system. The only difference is that, if you look closely, you can spot the charging point under the badge on the front grille. Both come with 21in wheels, a panoramic roof, signature headlights and the strong, handsome body shape associated with Range Rover. Inside the Autobiography version that I drove on the tourist route from Glasgow to Rosyth was beautiful Satin Straight Walnut veneer – a matte wood finish with Autobiography design details – and perforated leather seats. It has a command dial on the centre console for different gear changes while the Sport uses a conventional gearstick. Significantly, both have an EV button so that you can save electric power for driving sympathetically in towns and cities and use the traditional engine on the open road or in parallel with the electric motor for extra boost. It has a 31-mile range in electric mode only and can travel at speeds of up to 85mph. Regenerative braking can top up the battery. It is odd but compelling to drive silently in a Range Rover but the boost when you put your foot down from both units is exceptional. It has great power but with all the superb handling you expect coming from systems such as the dynamic stability control, cornering brake control, roll stability control and electronic traction control. The power on board the Prince of Wales is used in a series fashion. The four generators – two forward and two aft – can also each be used separately. Engineer Chris McIlroy, of the Aircraft Carrier Alliance, described them as “Islands of Power”. He said: “This is a warship that needs to keep going irrespective of what damage might occur. One of the key challenges we had was to build in a level of redundancy and sustainability in a war situation. Indeed, this new breed of aircraft carrier will take us into the middle of this century and it was described by Commander Mark Fitzsimmons as “the most advanced aircraft carrier in the world”. It is two and a half times the size of its predecessor, the Invincible, and is due to be fully operational in 2023 when it will accommodate 36 of the new F-35B fighter jets as well as four Crowsnest helicopters that replace the venerable Sea Kings. The hangar alone can hold 23 F-35B Lightning fighter aircraft, with 13 more upstairs on the flight deck, and is packed with technology to get them out and up as soon as possible. This includes two lifts that can take two jets at a time, 10 aviation fuelling points and four weapons lifts. The 920ft-long flight deck, unlike American carriers, which are flat, has a steep rake at one end. The purpose of this feature is to – literally – throw the fighter aircraft into the sky, giving them an extra five per cent of height and better weapon and fuel carrying capability. “This is returning us to a scale we haven’t seen for a long time,” said a quietly proud Commander Fitzsimmons. “The size, capability and complexity of the Prince of Wales make this ship an exceptional hi-tech piece of kit.” It is a truly remarkable vessel and the latest to emerge from Scotland’s proud history of shipbuilding. It cost – along with the Queen Elizabeth – £6.2billion. A Range Rover will come in at a bit less – £87,600 for the main model in Vogue rising to £106,500 for the Autobiography and from £72,185 for the Sport in HSE trim to £85,785 for the Sport Autobiography Dynamic. Peter Wright, engineering manager of the Range Rover PHEV, points out that his baby can trace its lineage back to the 1960s and the first Range Rovers. And the hybrid is in no way limited because of its powertrain. It is as capable and broad-shouldered as its full-fat brothers, with systems such as all-wheel drive, hill descent and low traction launch. 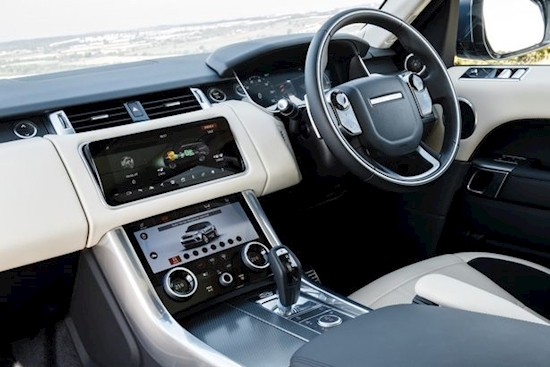 It comes with the kind of safety and luxury features Range Rover are famous for as well as the hi-tech infotainment system. Amazingly, there’s even a socket for a domestic plug. I like that. The 13.1kWh battery powering the electric motor can be fully charged in two hours and 45 minutes on a fast charge or simply plug it in overnight at your home. One thing for which Peter Wright will be grateful is that by using the electric motor skillfully, you will scarcely need to visit a filling station in a week. By contrast, Chris McIlroy on board the Prince of Wales needs 500,000 litres just to start his engines. Hope he has a Tesco card.